Somewhere, there is a whole junkyard full of busted tape recorders like that field of duplicated hats at the beginning of The Prestige. Jim Phelps and his Impossible Missions Force went through one a week for twenty-five weeks, for eight seasons, and this was in the days before disposable electronics! 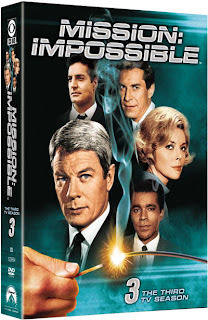 But each smoking cassette player meant another taut, thrilling mission, and CBS/Paramount’s new Mission: Impossible: The Third TV Season offers up twenty-five more fine examples of such from the 1968-69 season. Phelps was played by Peter Graves, and Graves mastered the furrowed brow while listening to those recorded mission briefings. (It must have resulted in a lot of premature wrinkles.) And when I say "mastered," I mean it! He’s not just crinkling up his forehead to have a bit of stage business to do while the tape recording does the talking; he’s acting. As he listens to the scant details with which he’s provided, we can see him already formulating his ingenious plan. Each furrow of the brow is a crucial step in an elaborate heist, another layer to the big con. Once I caught onto what he was doing here, Jim became a much more proactive character than he seemed at first. Later on in the episode, it’s electronics wiz Barney (Greg Morris), seductress Cinnamon (Barbara Bain), and (especially) master of disguise Rollin (Martin Landau) who will have the showiest roles, but Graves makes it clear that Jim is the man with the plan, the architect of the entire dazzling operation to follow. The formula remains essentially the same this season (although the repetitive "team selection" sequence has been mercifully omitted, except for missions on which Jim requires a guest agent), but producer Bruce Gellar and his writers have still somehow managed to outdo themselves and come up with what is probably the show’s strongest season yet. Sure, there’s more of the same (more phony psychic powers, more doctored playing cards, more gullible foreign dictators, and more masks than ever), but there’s also a new, hitherto unseen personal layer to the proceedings. This season, the characters become more than just highly capable cogs in a masterful scheme; they’re humanized. This is thanks to a few episodes that drastically shirk the formula and give us more insight into Phelps and his team. The best example of this is "The Exchange." Right away, the viewer is aware that he or she is in for something different. It doesn’t begin with the typical "your mission, Mr. Phelps, should you decide to accept it" taped briefing, and there’s no exploding player. Instead, it plunges us into the final moments of an unseen mission, like a Bond pre-credits sequence, or the opening of Brian DePalma’s Mission: Impossible film, for that matter. The team is in the Eastern Sector of an unnamed foreign city, an obvious stand-in for East Berlin. Cinnamon is in the military dress of this communist power. She photographs some documents, but suddenly alarms start to blare. She’s trapped! She has just enough time to heroically toss the camera out the window to Jim and strongman Willie Armitage (Peter Lupus, also in uniform) before she’s captured. Back in the safety of the Western Sector, we see a very different Jim Phelps than we’re used to. His tie is off; his collar’s unbuttoned. And he’s worried. For once, events have not gone according to his precise plan. He’s sweating it. Clearly, the famous words we didn’t hear in this episode are weighing heavily on him: "Should you or any of your IM Force be caught or killed, the Secretary will disavow all knowledge of your actions." "We let her down," laments a distraught Jim, clearly feeling the full responsibility of his role as team leader. "They can break anyone. She may not be the same Cinnamon we knew once they’re finished with her... but they’ll break her. Then they’ll kill her." Thus different stakes are set for this episode than those we’re used to. Instead of discrediting some unknown foreign dictator, the team must devise a plan to rescue one of their own. This tense episode leads up to a good old fashioned border-crossing prisoner exchange, a scene familiar to any fan of Cold War spy movies. The IMF gang even get to wear trench coats! Of course, in keeping with the genre there’s still one twist yet to come... "The Exchange" takes a number of surprising risks for a show of this era, especially one so entrenched in its regular, successful formula. 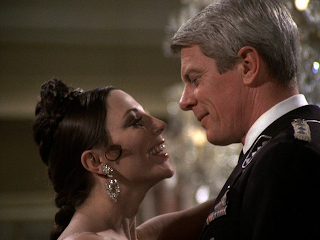 The result is an espionage classic, and one of the very best episodes ever of Mission: Impossible. And it’s not the only episode this season to eschew the formula. "Nicole" gives us another more personal story, focusing on Jim Phelps, and the result is good, though not equal to the success of "The Exchange." "Nicole" is a decidedly uncharacteristic Mission: Impossible episode. It feels a lot more like a Danger Man or a Saint. 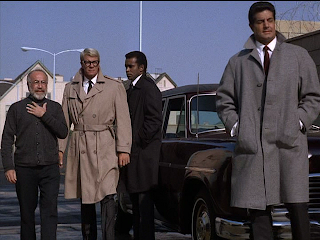 Most of the team sit this one out as Jim and Rollin infiltrate a swanky party in disguise (as Sidney Bristow would do so often several decades later) to steal the same MacGuffin that would fuel DePalma’s 1996 film, a NOC list. (This one identifies American agents who have been turned by the other side.) Rollin has a lot of fun playing a lecherous old general, perpetually hitting on the glam Sixties dollybirds (atypical for the show) who populate this surprisingly swinging Commie shindig. 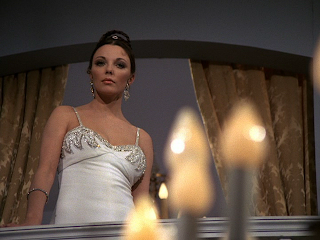 Jim, passing himself off as his aid, also finds himself flirting... with no less a femme fatale than Joan Collins as the titular agent Nicole. 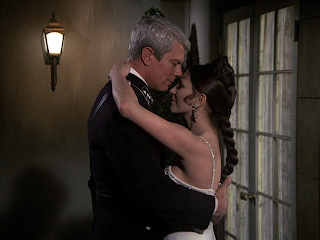 She sizes Jim up as "unmarried, but not un-scarred," leading to some James Bond-style banter. It’s very strange to see Jim flirting. It’s not a side of him we’ve seen before, and he doesn’t seem that comfortable at it. I suppose that’s because he doesn’t often let his guard down as much as Nicole inspires him to do, but her allure proves great enough to cause this usually thoroughly professional spy to make some mistakes. A pressurized floor alarm (again, shades of the film) gets the best of Rollin, and the pair end up forced into some atypical but exciting gunplay. Rollin escapes with the list, but Jim is shot and captured. Nicole aids his recovery and his escape, but which side is she on? We’re treated to such spy tropes as double crosses, double agents (even one code-named "Sparrow! "), disfigured villains and arty shots through wine glasses as Jim flees for his life and tries to figure out whom he can trust. And by the time all is said and done, one IMF agent will have very uncharacteristically shot and killed a man himself, and another will have shed some equally uncharacteristic tears. 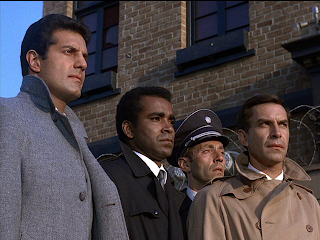 The whole affair feels like one of those Prisoner episodes that feel like Danger Man episodes ("A, B & C" or "The Girl Who Was Death"); it’s one spy show masquerading as another. But it’s thrilling, different and highly entertaining. Its undoing, however, is that it’s also fairly predictable. It may not play by the standard M:I playbook, but it follows a formula nonetheless, and one with which spy fans will be familiar. "The Mind of Stefan Miklos" proves that the show doesn’t have to break with its formula in order to excel. This one is by the book, but sublime in its execution. The Ameri-cans are feeding a known double agent, Townsend, misinformation. His assistant, Simpson (Ed Asner), suspects, and reports his boss to their controllers, who send their most brilliant strategist, Miklos (Steve Ihnat, looking as if he just stepped out of a Yaroslav Horak illustration), to investigate. For once, Jim must compete with an opposite number every bit his equal. The regular heist and con routine isn’t enough (although the episode features both); he needs to create a double bluff. He needs to let Miklos uncover one IMF plot in order to legitimize another. "His ego demands that he use his own brilliance to assemble the pieces of the puzzle," Jim informs his colleagues. But the game isn’t played mano a mano; the whole team chips in. 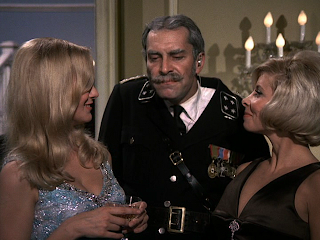 Martin Landau (pictured here in his leering general guise from "Nicole") really shines this episode when Rollin must play two different roles (without masks, for once) to trick two different people. One moment he’s excellently impersonating the assertive Miklos; the next the jittery, nervous Simpson. The sudden transformation is remarkable. It spoils nothing for the astute Mission viewer to reveal that Jim and his team come out on top, but watching how they get there is particularly rewarding this time around, and demands close attention. At the end, Miklos, tricked into thinking that he has won, says, "I wish I could meet the man that masterminded their operation. He was brilliant. I feel sorry for him. He played the game well. But he lost. It’ll destroy him." Phelps is listening through a bug, fully aware of the irony and clearly feeling the same way. As fun as the show is, and as superb as this season is, Mission: Impossible is not without its shortcomings. 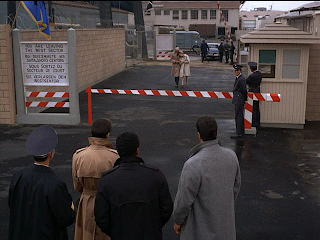 Besides the obvious backlot sets, we get some of the same gimmicks we’ve seen before, and we get an annoying tendency for the agents to freeze up (practically giving themselves away) when it looks like some guard has caught onto their scheme just before a commercial break, only to learn when the show returns that they’d actually planned for this exact eventuality, so that display was purely for the benefit of the audience. We also get occasional episodes that collapse under their own convoluted intricacy, like "The Freeze." (The IMF spends millions and millions of dollars setting up a fake cryogenic laboratory and fake future of the faraway year 1980, complete with flatscreen TVs, 8-tracks that behave like DVDs, plastic shrinkwrap dresses, and bubble-topped future cars, just to convince a bank robber he’s been asleep eleven years for... well, it turns out there was really no reason at all to do it.) But perhaps hardest of all for a modern viewer to swallow are the heavy Cold War politics. While Mission: Impossible doesn’t use actual countries or governments, they do use a Cold War shorthand relying on audiences to instantly identify certain buzzwords ("dictator," "anti-democratic," "anti-Western") as automatically evil. (Hm, sounds like a certain administration I can think of!) The writers often don’t bother to paint the various foreign leaders who fall at the hands of the IMF as evil beyond that shorthand, so in some cases the heroes come off looking like a bunch of jerks, often hurting people who don’t really seem like they should deserve what they get. In "The Elixir," for example, Riva, an Evita Peron-like would-be ruler of a South American country (whose only vice we witness is vanity, though we’re told she’d make a cruel dictator), ends up the victim of some very cruel plastic surgery, robbed of her face and, as a result, hauled off to an insane asylum. (Duped into having the procedure, if you can believe it, because of 37- year old Barbara Bain’s, ahem, "youthful" good looks!) And in "The Play," the IMF dutifully subverts the artistic freedom of playwrights and actors to further their pro-Western cause. It plays like The Lives of Others in reverse! In the course of this particular operation, they also claim a completely innocent victim, duping a sympathetic Eastern European actor into leaving behind his country and his life for a bogus offer of Broadway stardom! "The Bargain" is a great episode that actually affords Barney the chance to spy through a cracked doorway while disguised as a Cajun chef and Cinnamon the opportunity to dress like a French maid, but ultimately spells doom for an exiled Central American leader whose only crime we’re let in on is a passing similarity to Fidel Castro. In 1968, I suppose that was enough. None of that should be enough to dissuade a spy fan (of any creed) from snatching up this fantastic DVD set, though. It’s easy to see past the dated Cold War politics (though it’s curious that the American Cold War spy shows have dated more poorly than their British equivalents) to some very tight writing, taut directing and splendid acting. Furthermore, any show that can consistently pull off so simple a trick as switching actors and saying it’s another person "wearing a mask" deserves a lot of respect. I’ll be honest; they get me every time with that. Even though it’s no longer Martin Landau on screen as soon as he pulls on that latex face, I remain convinced that I’m watching Rollin. And I don’t suspend disbelief so easily for just any show! There’s a reason why Mission: Impossible is one of the most famous spy series of all time, and it’s all on screen in The Third TV Season. Unfortunately, there’s one piece of bad news to accompany this review. This set bears the same warning as Season 2 of Hawaii Five-O: "Some episodes may be edited from their original network versions." I suppose that means that Paramount was only able to find syndication masters for some of the episodes, and not original broadcast masters. I am not familiar enough with the series to identify which episodes this affects. On the upside, however, the picture and sound quality are phenomenal this time around, easily beating the previous seasons’ presentation. Mission: Impossible: The Third TV Season is one of the must-buy spy DVDs of the season. Great review! Can't wait to dig into the collection! Thanks! I hope you enjoy it as much as I did. Even if someone hadn't seen either previous season, this is the one I would recommend to buy first. Barney's side eye is priceless. Mission: Impossible currently airs on MeTV.